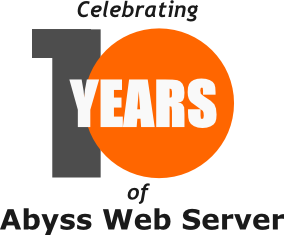 10 years ago Abyss Web Server version 1.0 was released to the public. In a tiny installation package (less than 120 KB) early adopters discovered a capable Web server with an intuitive user interface called the Web console. The software was free, developed and supported by Aprelium Technologies, a small self-funded company based in Tunis, Tunisia. Abyss Web Server has been multi-platfrom and available for Windows and Linux since its initial release. Word of mouth and postive reports helped build a good reputation for Abyss Web Server and the embryonic user community began to take shape on Aprelium's forums. The 100,000 downloads milestone took less than a year to be reached. Meanwhile, several updates were released and the software was relabeled Abyss Web Server X1. In late 2003, version 1.2 inaugurated the Mac OS X and FreeBSD ports. This version was rock-solid and needed no bug fixes or patches during its lifetime. Users appreciated the stability of the software and their encouraging feedback propelled the little Web server to higher heights. Soon, it started attracting favorable reviews from the specialized press. Several requests were made to publish it on CD-ROMs bundled with computing magazines and to write about it in books discussing Web programming topics. It took more than a year to work on version 2.0, but its release was a major step forward. Abyss Web Server was rewritten from scratch and built around a new architecture. It was released in March 2005 in two editions: X1 and X2. While X1 remained free, X2 was a commercial edition with additional features targeted towards professional and power users. We received our first order for X2 from a customer in Texas, US, only 5 minutes after version 2.0 was released. It was a wonderful moment for our small business as we felt that the time and money invested in creating, developing and improving Abyss Web Server has paid off. We kept enhancing Abyss Web Server in the following years. We have added more options and support for more and more sophisticated features without sacrificing its ease of use and compatibilty with old versions. As the first phase of the worldwide financial crisis hit in late 2007, we took a major decision to protect ourselves from market volatility. We decided to diversify our activities and not to put all our eggs in one basket. Our sales were good but we had fear that slowdown might affect our company and eventually lead to its bankruptcy. Our company was reincorprated as Aprelium and prototypes of new products were made. The new Aprelium was more like a company with a Research and Development facility rather than a small software publisher. Undergoing such a structural change took a lot of time and energy and may explain why the release of version 2.7 of Abyss Web Server came more than two years after the introduction of version 2.6. But this move proves to be the wisest decision we have ever taken as it helped us stay in business despite hard times and unstable economy. Notwithstanding our diversification, Abyss Web Server remains one of our strongest product lines and we owe a lot to it. It also powers several other products and tools of ours. We use it on a daily basis on very busy sites we operate. The experience and knowledge we have gained over the last years help develop solutions that improve its quality. We are also committed to supporting it for the long term. Abyss Web Server would not have been so hailed by its adopters if it wasn't backed by a strong following. Several of its users and customers are actually part of this success story. Some shared with us great ideas, some spent time testing it, some reported problems and helped us fix them, some even became our friends and penpals. To all of you whose names we did not mention in this short note, we would like to say thank you for your indefectible support. We hope to continue the adventure together for at least another 10 years.